Safari in Mole national park | Your Beach House in Ghana • Right at the ocean! 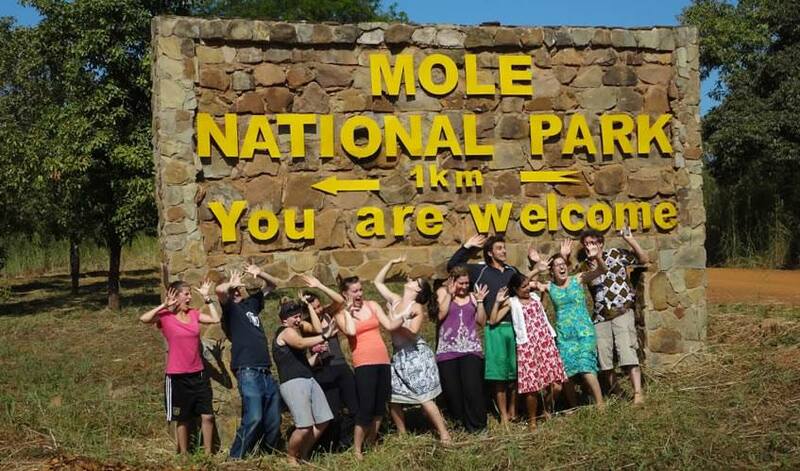 Mole is Ghana’s largest national park with 4849 square kilometers of space. It is best known for its often-seen elephants (a population of about 600). It also features buffalo’s, antelopes, lions, leopards, hippos and five species of primates – over 93 mammal species in all. There are over 300 bird species and 33 identified reptile species. The park is also Ghana’s most developed ecotourism site in terms of tourist amenities, including a motel and small museum. Although this level of development seems slight compared to national parks in many other parts of the world. While there are 40 km of roads within the park for game viewing, they reach only a small portion of the park. Experience a guided walking or driving safari of Mole’s wooded Guinea Savannah habitat and wildlife. Safaris are offered in the early morning and late afternoon. Visit the nearby village of Larabanga to see what may be the oldest building in Ghana and oldest mosque in West Africa, possibly dating back as far as the 13th century. The structure is made of mud and sticks. Bird watching is spectacular in Mole. Bring your binoculars, rent a bird guidebook from the tourist center in Larabanga and request a Mole guide with bird knowledge. Mole is 170 km west of Tamale. From the Kumasi- Tamale road, turn west at the village of Fulfulso and drive to the village of Larabanga to get to the park entrance. There are prominent signs for the park at these intersections.